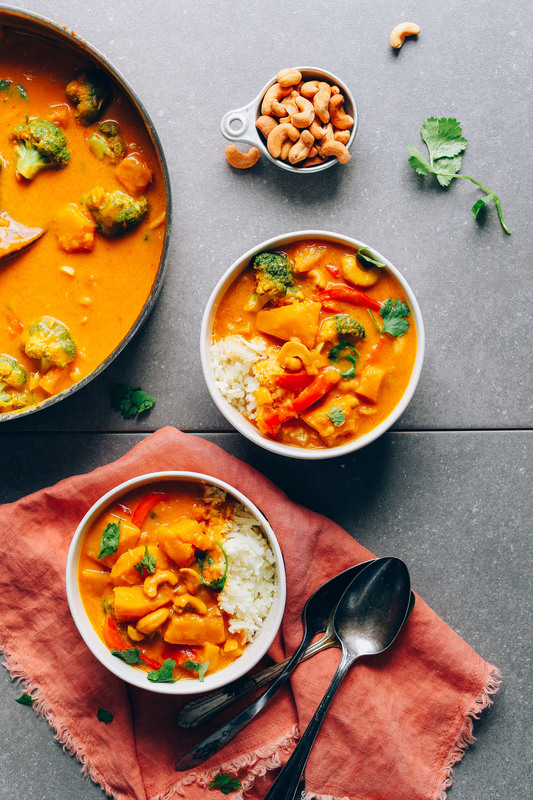 Friends, this fall has me going crazy over all things apple and and squash, and this curry may be one of my favorite curry recipes to date! Shall we? This simple curry requires just 1 pot to make! It all starts with gorgeous pumpkin, which is peeled, seeded, and cubed into bite-size chunks. The flavor comes in waves thanks to ingredients like curry paste, chili peppers, ginger, garlic, and shallot – a.k.a. the curry dream team. For vegetables, I went with vibrant red bell pepper and broccoli. That’s all you really need! And to keep the curry creamy and rich, I opted for light coconut milk, which complements the spicy flavors perfectly. For a healthy fat and EASY protein, I went with roasted cashews (something I always have on hand). But, if you aren’t into cashews or can’t do nuts, you could also add Quick Crispy Tofu, include Red Lentils, or simply serve over quinoa. Make this curry for hosting guests this winter and fall or when you need a satisfying dinner on the table fast. It would be an especially great dish to make ahead and pack for lunches throughout the week, as it reheats beautifully! It’s delicious on its own, but it would also pair well with my Thai Spring Rolls, 20-minute Asian Kale Salad, Coconut Curried Greens, Coconut Curried Lentils, or even Thai Iced Tea! If you try this curry, be sure to let us know! Leave a comment, rate it, and don’t forget to tag a photo #minimalistbaker on Instagram! We’d love to see how your curry turns out. Cheers, friends! 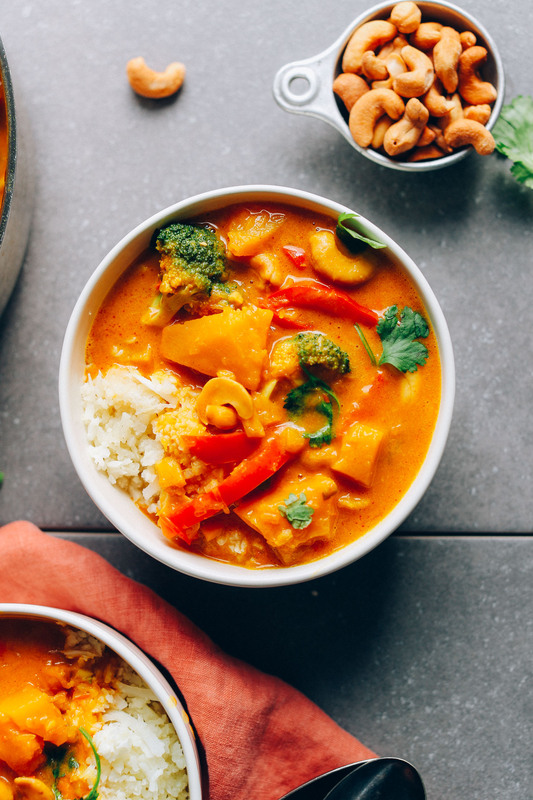 Easy, 1-pot Pumpkin Curry with yellow curry paste, coconut milk, fresh vegetables, and pumpkin. A simple yet satisfying plant-based, gluten-free dinner! *For protein, if you aren’t into cashews or can’t do nuts, you could also add Quick Crispy Tofu, Red Lentils, or simply serve over quinoa. *Nutrition information is a rough estimate calculated without sides/toppings, calculated with coconut oil. Have made this two months in a row, it’s tasty, not too many ingredients, it’s quick and easy to make with minimal washing up as I use only one pan. Family loved it. I used only one can of coconut milk. A little too oily for my taste. I suggest 1 can of coconut milk. This recipe is excellent! The only thing I did differently from the recipe was the addition of two sliced carrots. I used one can of regular coconut milk and one of coconut milk made from coconut milk powder because I only had one can in my cupboard. Thank you for the recipe – this one is a keeper! Made last night for vegan thanksgiving feast guests today. Used Kabocha squash, and left skin on – it has a pleasant texture cooked – plus adds color. Added 8 oz firm sprouted tofu, cubed. Will serve over a chewy brown, black & wild rice mixture w/ daikon radish seeds. Of course I had a small bowl last night and was over the moon with the depth and complexity of flavors. In future will reduce light coconut milk to one can, replacing the other with a low fat nut milk in order to reduce the meal’s fat profile. 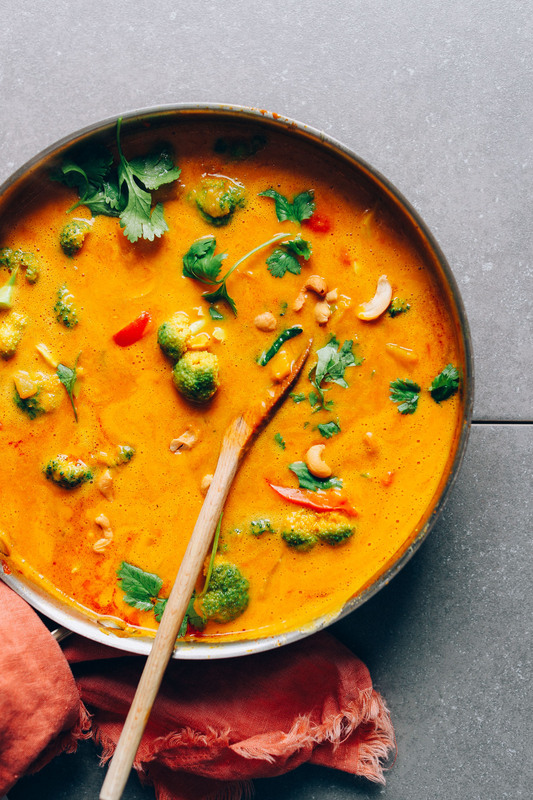 In all – this Thai curry is brilliant, flexible, and will now be a staple in my repertoire! Thank you & 5 stars! I like my bell peppers crisper, so I would put them later in cooking process next time….maybe just before broccoli. I made this tonight with my Community Supported Agriculture share of pumpkin, onions, green tomatoes, as well as store-bought broccoli. I added lentils and didn’t use any nuts. Yummy! I used cauliflower instead of broccoli and I also added a can of rinsed chickpeas to the recipe. It was so so so good. I will try it again with broccoli this time. I always top it with a handful of parsley. I omit chili pepper since I like the creamy and subtle spicy flavor of yellow curry. Another great recipe that I will continue to make. Thank you! I rarely comment on blogs. But I must say dear minimalist baker you seriously out did yourself. This is a SHOW stopper recipe and I am so happy to use it over and over again. Thank you! Yay! We are so glad to hear that, Marianne! Perfection! We didn’t change a single thing and it turned out very very well. Thank you for the awesome recipes! Excellent! I used butternut squash and it came out PERFECT! Instead of quinoa, I used brown rice made with coconut milk. I used a red Thai paste. I will try a different one next time. Overall – YUM!!! My second recipe from this site and another keeper! I’ll be making another batch this week! This was good! I used kabocha squash, red pepper, and cauliflower, and subbed almond milk with coconut extract for the coconut milk. Thanks for the recipe :) I ate half with some jasmine rice and it was so filling and satisfying! Fantastic recipe! I’ve made the dish twice now. Definitely a keeper! I made this adding a bunch more veggies a bit of my favorite curry powder. Delicious! I used 1.5 tablespoons of curry paste and it was as spicy as I can handle. Also super good trick- I put my pumpkin in my Instant Pot for a 6 min pressure cook and then let it cool the day before. This made it ridiculously easier to peel and cut in chunks. I found that my whole pie pumpkin came out to be more than what this recipe called for but I used the whole thing any way, so I wish I would have used a tad more fresh garlic and ginger for the base to balance the curry. I normally go light on th salt with most recipes, but this one definitely needed the salt to bring out the full flavor. Tons of leftovers, made a double batch of brown rice and could have used a little more. I made this tonight and while I don’t usually leave reviews, I had to! There is a Thai curry at a restaurant that I love but I had never thought to recreate it. While I wasn’t trying to, I unintentionally did when I made this. This is the best curry I have ever made, I cant wait to make it again! I added chickpeas as a protein and it worked perfectly. I love all your recipes and this is no exception! We’re so glad you loved this recipe, Julia! This was amazing! Would recommend 100%. Holy delicious! Roasted the pumpkin in the am and made the dish for dinner. The kids wouldn’t go near it, which is fine, because there’s more for me and hubby. We both looked at each other and said “never eat out again”, or at least when we have pumpkins on hand. Thank you for sharing such a satisfying and scrumptious meal. My only con comment is I found my self scrolling back and forth for measurements of the ingredients when walking through the steps. I had them all at the counter but not chopped or measured out to proportions. Made this tonight for a birthday dinner. It was delicious!!! I added veggie broth and reduced the amount of coconut milk by 1/2. The consistency was neither too soupy nor too thick… ’twas perfect! Thanks for the recipe and I’m looking forward to making it again. Omigoodness this is amazing! Made tonight with butternut squash. The flavors were absolutely on point – worth all the chopping! I added chopped carrots at the end with the broccoli for added crunch. Also, I substituted coconut water for 1 can coconut milk. It worked well! I’ve made this dish twice now with butternut squash and it’s delicious! Thank you so much for sharing your incredible talents. 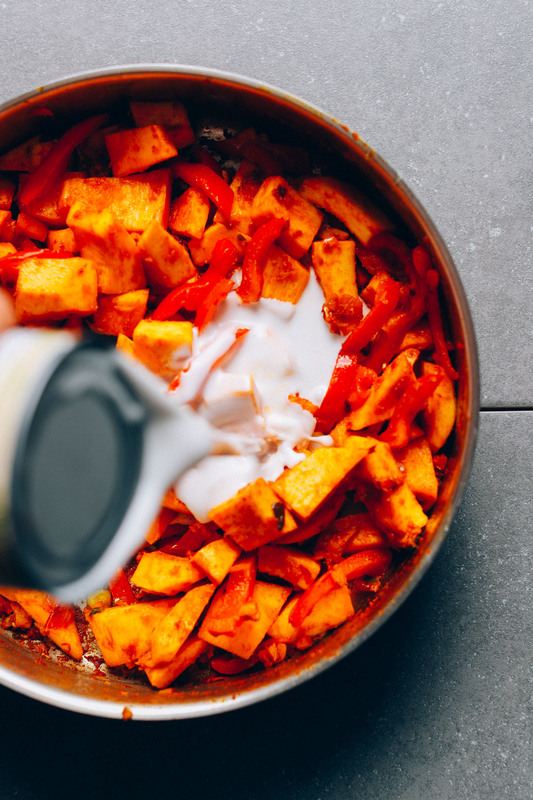 I made this last night with butternut squash – SO GOOD! It’s now part of our regular rotation. I roasted the squash first – next time I’ll follow your suggestion to pure some of the squash with stock then add the rest of the roasted squash at the end (to keep the crispiness a little longer). I also made the red curry paste from your recipe – this is also a new staple in our house! I made this last night and instantly fell in love! I used 1 can of puree’d pumpkin as that is what I had in the pantry and it gave it a thicker, creamier texture. I added a lot of extra red curry powder in addition to the curry paste to give it a little more flavor and added about a teaspoon of cumin. It was so good I wanted to eat it for breakfast. Made this yesterday and it turned out amazing. I only had 14oz coconut cream and veggie broth, so I used those, and it was a perfect thickness, so I decided not to blend the broccoli. Makes amazing leftovers. I’m very happy with this! I hope to make it again someday. Hi Dana! I made this curry dish tonight. It was amazing. It definitely is going to be made many more times. Thank you! Hi! I plan on making this tonight and am very excited. I hope this question doesn’t sound stupid, but am I supposed to pre cook the pumpkin? Or just let it simmer? I assumed it would be simmering, but my boyfriend is suggesting otherwise. Weeks ago, I bought a pumpkin on a whim but had no idea what to do with it. It just stared at me from the counter all this time. And then I came upon your recipe and made it just now, and it is amazing! 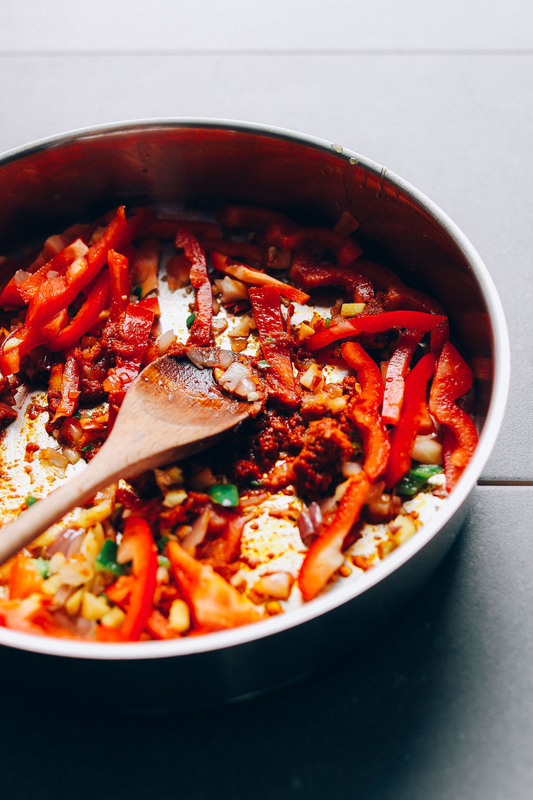 It comes together easily, without much fuss or mess, and it is so flavorful and hearty. Thank you! I made 1-POT PUMPKIN YELLOW CURRY. We had it for dinner last night and I then had some for breakfast today. As it was the first time making it, I cut the recipe n half. Worked perfectly. The one thing I did differently, because I forgot to buy brocolli and didn’t want to trek back to the store, I put in fresh green beans. I will make this again. Used green curry paste and did without garlic. Absolutely delicious and received many compliments from my roommate and boyfriend! Thank you for this recipe, it will become a staple! I made this for dinner last night. Incredible. It has to be the best curry I’ve ever tasted, let alone made. I am craving my leftovers for lunch already. This is going on the list of best recipes ever. Suggestions for subbing canned pumpkin puree? Hi Kayla! It will be a different dish if you do that – more like a soup. Perhaps it would be worth making my Curried Butternut Squash Soup instead, but sub your pumpkin purée for the squash. Thanks! Pie pumpkin should work if I’m going to do fresh (not canned), right? I made this last night and had an amazing dinner, I did some personal modifications (olive oil for coconut oil and vegetable broth instead of coconut milk). Simply delicious! I’m new to the site but think I’ll definitely stick around.. ;) THANK YOU! Forgot to rate it: definitely 5 star! I made this last night and it was sooo good! I had to make a few modifications as I didn’t have all the ingredients. I used 1 can of coconut milk instead of two (subbed veggie broth for 2nd), used an onion instead of shallots, used butternut squash, and omitted cashews, but added tofu! I also reduced the sugar to 1 TB. This is so amazing, It came together rather quickly, even when accounting for peeling and chopping butternut squash! I plan on eating it for lunch the rest of the week. This is an absolutely fantastic recipe. I was afraid of the spice level (due to three small kids) so I didn’t add the red chili. It still came out intensely flavorful and not too spicy. I’d even go so far as to say this is my new favorite recipe. A keeper for sure! The dish tasted amazing but I highly recommend adding significantly more curry paste to this dish (I added the entire jar of recommended curry paste), as it is pretty tasteless with just 3 tbsp. Other than that this is the perfect fall/winter recipe. It tastes absolutely incredible! So simple and so rich in flavor. Even my husband that hates pumpkin asked for more. Hi! Hmm, I bet you could start sautéing the vegetables on high (as instructed), and when it comes to the simmering part, cook it on low for 4-6 hours? Let me know if you give it a try! Made this tonight for Thanksgiving dinner tomorrow. Soooo delicious! I had roasted a bunch of pie pumpkins and put in the freezer about a month ago, so I used those. So mine was more creamy than chunky but the aroma of it cooking – I just knew it was going to be fantastic! I also used full fat coconut milk. Thank you for continually sharing top notch recipes! Thank you for the sweet comment, Erin! Happy Thanksgiving! This was really delicious and warming. Next time I think I would use the cashews as a garnish and sprinkle them on top at the table, but they were good cooked into the curry as well. Thanks for a good recipe! This was incredible and so flavorful! Thank you for sharing! I’m always looking for ways to make my carnivore friends salivate – and this did the trick. I’ve never cooked with a pumpkin before so cutting it took awhile. Microwaving the pumpkin for few minutes helps – take your time and maybe do it the day before! I made this last night. It was amazing! Very easy recipe and the flavors are just right! Thank you Dana! I made this and it is out of this world amazing!!!! I used butternut squash instead of pumpkin – so much easier to cut up. I love curry, but wasn’t sure if squash in a curry dish would be weird. Overall, It was so amazing that this is my new favorite soup! Definitely add the cashews – it gives some texture and crunch. So cozy and good! I used a can of pumpkin puree instead of cubed pumpkin and added zucchini, tofu, and spinach. Ah I love it so much! Thank you! I have made this recipe twice now and love it! I made it as written with no alterations and it is perfect! It is definitely my family’s favorite curry recipe. I like to kick it up a notch and used a habanero instead. It’s excellent regardless of the heat intensity! Thanks Dana for this wonderful curry recipe. 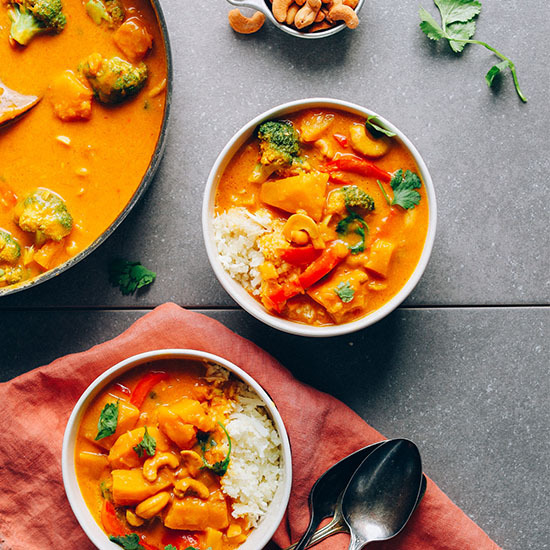 This is the BEST pumpkin Thai curry recipe I’ve found!!! 10/10 – perfectly sweet, spicy, flavourful and downright delicious!! This has become a weeknight staple in our household, thank you so much!! So delicious! I don’t like spicy food so I just left out the pepper and it was perfect. I highly recommend this recipe! Hi! What type of pumpkin do you recommend? A sugar pumpkin? I was wondering the same, we have a bunch of “carving” pumpkins we didnt carve for Halloween. I’m using them for decor but if we could eat them I’d do that. This recipe is AMAZING! Just made it and am floored with how good it is – particularly because I’m not known for my cooking skills :) Thanks so much! Made this recipe yesterday and it is just amazing! It is warming and full of flavor. I do always need way more time in the kitchen for preperation (cutting the pumpkin for instance) but is was totally worth it! I made this yesterday with sweet potato instead of pumpkin and it was very nice. Perfect flavours, thank you for the recipe. This looks delicious! I have some green lentils (petite French style) I would love to add to the recipe for extra protein and thickness. At what step of the recipe would I add them, and what size portion would you suggest? One cup? Thanks for sharing such awesome recipes! This is a great recipe! I made it with butternut squash and it was delicious. I don’t like ginger, shallots and chili peppers so I left all of those things out and used full fat coconut milk and it tasted wonderful. This is definitely one of my new go to recipes! I made this for dinner this week and it was so good! I prefer a thicker curry, so I added in lentils and a diced potato. Lovely recipe! First time commenter-but I have been following and basically exclusively cooking from MB recipes for a couple years now! Thank you for helping make my transition from vegetarian to vegan painless. Just finished making this pumpkin curry and WOW it is delicious!! Home run recipe, Dana! I omitted the serrano pepper and it still turned out perfectly spicy for my midwestern palate. Love the tip about blending half the sauce, it adds a great texture to the dish. This will definitely be added to the weekly menu rotation. Absolutely delicious. I served it over quinoa and will definitely do a second batch this weekend. Best curry I ever made myself. Thanks for this great recipe, Dana! (So helpful that you always include the ml and grams since I live in Germany and we don’t use “cups”). Great curry recipe. I added some whole cumin seeds to the coconut oil and browned them before adding the shallots, garlic, jalapeno, & ginger. Worked great with butter nut squash. I also roasted the seeds of the butter nut squash and put them on top. The roasted cashews added a nice flavor crunch and flavor to the curry. This is a recipe we will defiantly make again! This recipe is fantastic. Followed instructions exactly using butternut squash, and added some tofu and mushrooms. Thanks!! MAKING THIS TONIGHT FOR SURE. Made this tonight and it was AMAZING! Added tofu and an extra can of coconut milk. Would definitely make again. Whoop! So kind! Thanks for sharing. This recipe was absolutely glorious!!! Thank you Dana :) made this for dinner and it really hit the spot. I’d never thought of adding lemon juice into curry before but it made the flavour so unique. Oh yay! Thanks for sharing, Denise! I made this tonight and it’s fab! Instead of add the broccoli directly to the pot, I boiled it for one minute in hot water, ran it under cold water and then added it at the last minute. This ensured crisp broccoli! Really great. This curry was amazing, the whole family loved it including kids. They never really liked butternut squash before but they found it delicious in this recipe. Thanks for coming up with the wonderful combination of flavors. I blended some of the squash with the sauce/broth and it made it so creamy. Loved it! Would it be possible to make this in an instant pot? Any suggestions for time and settings? Hi Stacey! Hmm, I bet you could start sautéing the vegetables on high (as instructed), and when it comes to the simmering part, cook it on low for 4-6 hours? Let me know if you give it a try! This looks great; I make something similar with kabocha squash or sweet potato and whatever veggies I have around. One tip: I never buy “light” coconut milk because it costs the same as regular and it’s just coconut milk thinned out with water. So for recipes calling for light I just use half the amount of regular coconut milk and add water or veggie broth, whatever works for the recipe. It was so good that the pot was empty before i could take some pictures! :) Loved it. So good! So good that I have to leave a rating!!! :) I love the touch of lemon! Though I think I overdid it a bit haha. I made this tonight and it was AMAZING!! One of my fav recipes of all time. Thank you!! Making this as we speak! Smells delicious! About to throw the broccoli in and will report back with turn out! Absolutley fabulous! I used butternut squash about 4c and added 2c broccoli and the cauliflower I had in the fridge. Definitely making this again soon. This recipe is a winner. 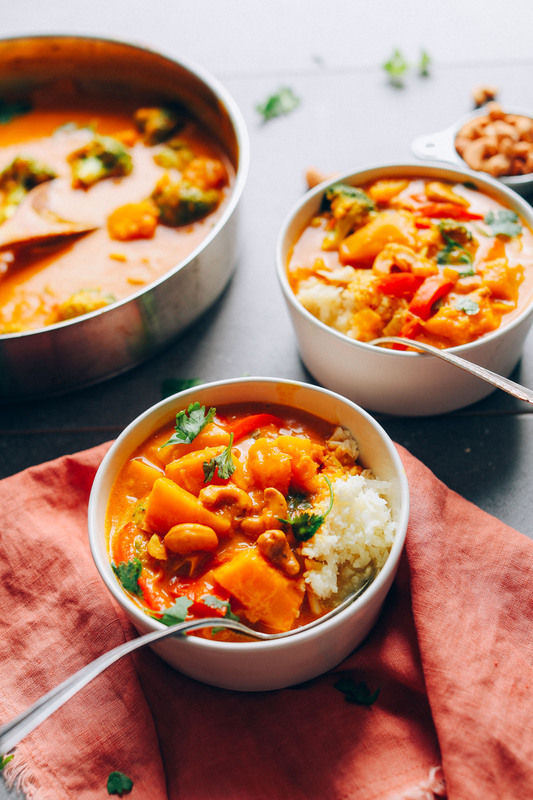 We carved a bunch of pumpkins yesterday and made this curry dish last night. It is going right on to our “Favourite” list. Sounds like the perfect fall activity! Glad you enjoyed it, Tom! This looks awesome! What would you recommend for making it less spicy? Would just leaving out the hot pepper do that, or would it be missing something/too sweet in that case? thanks! love love love your recipes! Hi! Reduce the amount of curry paste you add on the front end, as that’s usually the source of heat. And you can make up for any lost flavor by adding more turmeric, lime, ginger, and salt. xo! Hello, I made this last night and it was absolutely perfect! I loved it. Thanks for the great recipe. I encourage everyone to make it!! Yay! Thanks for sharing, Gail! This recipe turned out really, really well. Thank you for sharing. It’s definitely on par with the vegan pumpkin curries that I’ll order from restaurants every now and again. For anyone interested, here’s the version I used: sautéed in water, used a panang curry paste, coconut aminos, regular coconut milk (1 1/2 cans) + a big splash of broth. It was fairly spicy before I added the last 1/2 c of coconut milk and a large extra pinch of coconut sugar. Serving it over white rice toned it down just the right amount, and I added a pinch of salt to my serving. The cashews are soaking and I forgot about the basil, will add them into the leftovers though for sure. Wow, I improvise decent curries a lot, but this recipe has schooled me. I followed the directions pretty much exactly, just added red lentils and a little nutritional yeast at the end. I think I could eat the entire pot myself. It has such a bright, vibrant, layered flavor to it. Another masterpiece, Dana. Thanks! So yummy!! This weekend, I have made your pumpkin muffins (hiking snack) apple pumpkin muffins (just because) and now this delicious curry. My family and I, Thank You. Awesome, thanks for sharing, Lisa! Couldn’t find yellow or red curry paste, so I used green. Flavors were wonderful! Wonder what it would taste like with the other curry paste. Lovely, thanks for sharing, Katie! Hi Dana! I ❤️ your recipes, you’ve been my go to blog for almost 2 years now. I used to print your recipes so it’s easier to put somewhere in the kitchen as I’m chopping and preparing stuff, but It doesn’t seem to work anymore.. there seems to be some kind of glitch when I click on the print friendly version. It used to show me the page I’m about to print and now it’s just a gray box and when I click print nothing happens.. And I can print recipes form other websites just fine so I’m pretty sure it’s not my computer or printer but your website problem. Anyways, I hope you look into it :) Thank you for all the amazing recipes! You really made mine and my husbands transition to veganism easy and delicious! We love your cookbook as well! I just made a bunch of pumpkin puree. Is it possible to use that insteaf of cubed pumpkin? Thanks! Looks great! It will be a different dish if you do that – more like a soup. Perhaps it would be worth making my Curried Butternut Squash Soup instead, but sub your pumpkin purée for the squash. Hi! I made this with (about) 1.5 cans pumpkin puree, one can coconut milk (instead of two as is listed in the recipe), and served it over rice. It came out perfectly! Looks PERFECT, absolutely PERFECT! I really want to try serving this with spaghetti squash or cauliflower rice! That’s what I’ve done above! I can say cauliflower rice worked perfectly. Lovely, thanks for sharing, Laura! Incredible flavors. I used butternut squash and it was spot-on delish. Thrilled to have plenty for leftovers. Really phenomenal! Incredible flavors. I used butternut squash and it was spot-on delish. Thrilled to have plenty for leftovers. Really phenomenal! I used your recommendation for yellow curry and it hit the spot! I wouldn’t use a prepared curry paste but make it fesh – other than that I am trying it, thanks. Lovely! I have recipes for green and red if you’re interested. Hi Dana – this recipe looks great. Could I substitute curry powder for the curry paste? Curry powder and curry paste are quite different. I wouldn’t substitute one for the other. 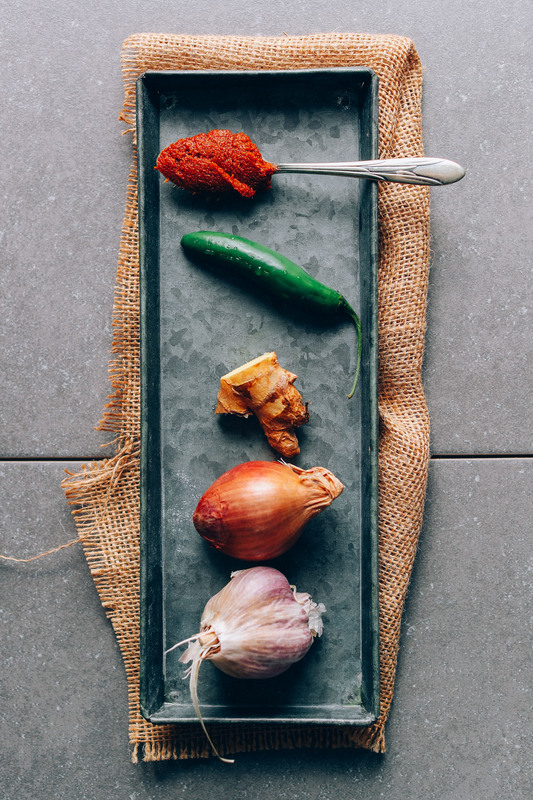 Dana’s red curry paste https://minimalistbaker.com/easy-red-curry-paste/ looks good. It isn’t hard with a food processor either. 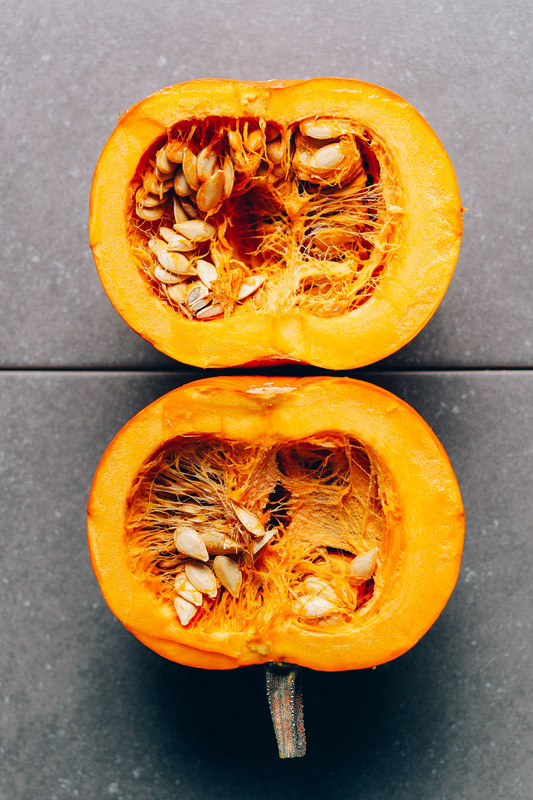 Could I sub pumpkin for acorn squash and would it cook the same? How would I need to prepare the squash? Or do you have another recommendation for the squadh. I have two in the fridge. Yes! I find acorn squash to be similar in texture to pumpkin, maybe a little softer. So cook the same but check for tenderness maybe 5 minutes earlier. Good luck! Let me know if you give it a try! Going to try this out this week! If I want to add red lentils, when should I do that? Right before step 5 maybe? Hi Nori! If you are not using pre-cooked lentils, I would try it then, let us know how it turns out! Sounds wonderful. Can’t wait to make it. Thank you! Can I use sweet potatoes for this? How exciting! I’ll make it tonight and report back! How can I make this in the slow cooker? Any ideas? Hmm, I bet you could start sautéing the vegetables on high (as instructed), and when it comes to the simmering part, cook it on low for 4-6 hours? Let me know if you give it a try! Dana, I am a certified international health coach, I love many of your recipes and would love to use them in some of my programs. How do I correctly give you credit? Obviously when I put your recipe up I’m going to want to name you as the source. Please give me the details. Hi! Thanks for reaching out – we do not actually permit our recipes to be republished but you’re welcome to share the recipes on social or your site, as long as it is just one recipe photo that links back to the recipe page on our site. Additionally, we ask that you do not share the full recipe anywhere. For more info, check out this link. we simmered longer than instructed and the pumpkin became mushy but was still delicious! This recipe looks so good! Going to give it a try this weekend.